Here's why you should consider raising meat birds on your small farm. Organic chicken is profitable - if you can control your losses (we'll show you how later) you can expect to net 40-50% of your sale price. In other words you can just about double your money in 10-12 weeks. Beats the stock market, eh? and, last but not least, your own chicken from your pasture or big back yard tastes GREAT! What's your market? i.e. how will you sell the birds, and how many do you think you can sell? How will you protect your birds from predators? Where will you get your feed, from a local farmer or mill or feed store? Where will your birds be processed? can you do it yourself, or is there an abattoir within an hour's drive? 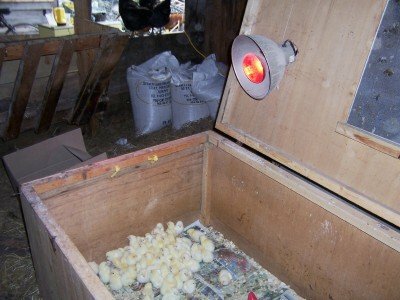 Do you have freezer space to keep a batch of birds until they are sold? What regulatory restrictions are placed on you when raising chickens? e.g here in Ontario we are only allowed to raise and sell 300 birds annually if we don't have a quota from the marketing board. Check this out carefully to avoid problems. Now is the time to start planning your farm for next year, check out the resources at right to help you make 2011 a successful year on your small farm . . .
What the heck is a Chicken Tractor? I didn't know the little cluckers could drive! 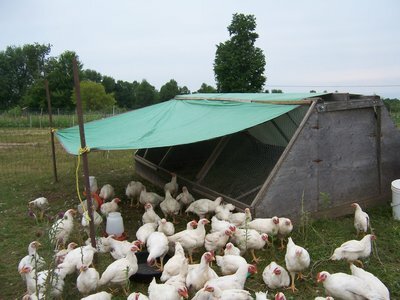 Find out more here What's a Chicken Tractor?